Rhum and Clay bring to the stage Dario Fo's seminal master piece, Mistero Buffo – a daring and explosive rallying cry for the disenfranchised. A travelling storyteller, another employee of the gig economy, rushes from his last delivery of the day to recount ancient tales of Jesus and his life... however these versions aren't like any you've heard before. 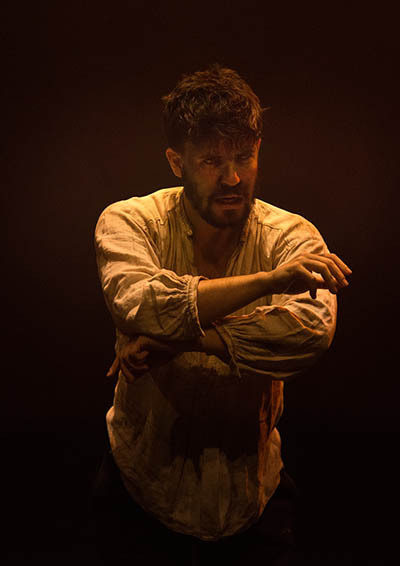 Darkly comic, sometimes tragic and always subversive, Mistero Buffo takes aim at those who manipulate truth and belief for power and control. "Spooner tackles a huge cast of characters ...with astonishing sharpness and clarity." "Magnificent production...with an astounding performance"
"A shapeshifting, body-popping, mesmerising performance"
"Julian Spooner is simply outstanding"
"Go and see this show right now"
With thanks to: The Dario Fo Estate, Arts Council England, David Byrne, Ellie Simpson, Alex Lui, Sophie Wallis, Helen Matraevers, Gemma Hattersley, Sophie Cullen, Rebecca Romero.